It’s no wonder that hydroquinone products dominate the skin lightening industry: this little ingredient is highly effective. The way it works is simple but potent: hydroquinone inhibits tyrosinase, the enzyme needed to make melanin, thus preventing the skin from producing the pigment responsible for skin color. And it’s great at its job. It’s effective and works much faster than the most known home remedies for achieving a lighter skin tone. This is why, despite the controversy related to potential hydroquinone dangers, this bleaching agent still reigns supreme as the most well-known, most popular name in skin lightening. Even the low concentration that’s found in over the counter hydroquinone – maximum 2% – is potent enough to get the job done. So what are the best over the counter hydroquinone products to accomplish all this? There are several factors to consider when choosing a hydroquinone OTC skin whitening product, so we’ve compiled an in-depth guide for you to some of the best safe skin lightening creams. Find below a list of our top picks! But before we delve further into product reviews, let’s zoom into the controversy surrounding hydroquinone. Many articles online advise against this chemical and it’s been banned in several countries around the world. Should you go for a hydroquinone-free product or not? It’s an important question in choosing the best over the counter skin lightening cream to use. The first step is to learn more about hydroquinone. A topical skin lightening agent, hydroquinone has been very effective in reducing skin pigmentation. As of recently, though, many experimental studies found it was cancerogenic for mice. As scary as it sounds, it’s important to keep in mind that these experiments involved high hydroquinone doses and the mice were actually fed with it. When it comes to topical application in humans in controlled doses, scientists haven’t identified any cancer-causing potential for hydroquinone. Still, as the active ingredient in some creams containing the maximum allowed dose in OTC creams, hydroquinone can have side effects. Some reported hydroquinone side effects include: photosensitivity, ochronosis (bluish skin discoloration), allergic reactions and general irritation, burning, stinging and dryness. If you understand the potential risks and follow usage instructions closely, then you’re on the safe side. Although, not everyone reacts the same to this chemical. It may turn out that it’s perfectly safe for you. But how would you know? So, if you’re looking for skin lightening creams without any side effects, this may not be for you. Perhaps you should go for homemade skin lightening creams – slower-acting and arguably less effective, but far safer. You can also check out our guide to the best whitening creams for face formulated with only natural ingredients. Hydroquinone is highly effective for skin lightening. It’s pretty much the only skin lightening creams ingredient that’s clinically proven to work on skin discoloration stemming from any possible cause. Wondering what exactly it can do for your skin? Hydroquinone is great for fading pretty much every type of hyperpigmentation like freckles, age spots, acne scars and melasma. But it’s not just effective at evening out skin tone – it can even be used to lighten your skin tone a few shades. Despite many hydroquinone over-the-counter skin lightening cream producers claiming fast, overnight results, hydroquinone also takes its time. It’s effective, but it takes weeks to see results. Hydroquinone disrupts the formation of new melanin in your skin, but it can’t destroy the already formed pigment. This is why it will take your skin weeks to slough off the old pigmented skin cells before they can be replaced with new, brighter ones. The bottom line then, if you first educate yourself and know how to use it properly, you can use hydroquinone-based creams. Do your research and pick you best over the counter skin lightening cream carefully. As you most likely know, there are tons over the counter hydroquinone products available on the market. But the ones we like the most are the creams, lotions and serums that also contain helpful ingredients to boost the potency of hydroquinone. After all, there's a good reason why hydroquinone creams are recommended to be paired with exfoliating agents like retinoids and AHAs: these exfoliants help hydroquinone penetrate better and deeper into the skin and speed up skin cell turnover so you see results faster. In the case of Emma Cardinelli's Skin Lightening Cream, it combines 2% hydroquinone with 6% Glycolic Acid. Together, they make a powerful tag team, with Glycolic Acid penetrating deep into the skin to unglue dead skin cells and pave the way for hydroquinone to do with melanin-inhibiting work. Our favorite thing about though is that it's fairly gentle as far as hydroquinone products go. It doesn't dry out your skin and actually feels quite hydrating. Plus, it's light enough to be layered under makeup and sunscreen, which makes it a great daytime hydroquinone cream. And it does a lot more than brightening, which is obvious when you consider its ingredients. For starters, this is a hydroquinone cream and it contains the maximum percentage allowed for over the counter hydroquinone - 2%. It also combines this with natural skin lighteners like Kojic Acid, Azelaic Acid and Vitamin C for extra potency. Hydroquinone at 2% concentration is pretty darn good but if you're looking for something stronger - this one's the go-to cream. It combines the maximum over the counter hydroquinone concentration with 2% Kojic Acid and 2% Bearberry Extract. The overall result is a pretty potent cream. And it's gentle on your skin as well, thanks to the fact that it doesn't use stronger exfoliants and instead uses natural exfoliants like pineapple enzymes to gently slough off dead skin so the skin lightening ingredients can absorb better. Overall, it's a solid, potent hydroquinone cream but with one big downside: we wouldn't recommend this if you have oily, acne-prone skin. It contains mineral oil and whereas it doesn't go on too heavy, it can make oily skin feel even oilier. For dry skin types, though, this one works! If you're looking for a strong bleaching serum that's packed with complementary ingredients and coupled with an affordable price tag, this is it. A true and tried classic, Porcelain's Skin Whitening Serum is one of the best hydroquinone over the counter products for intense brightening. Just keep in mind that this is actually "intense" and not ideal for sensitive skin. Not only does it contain the maximum concentration that's allowed for over the counter hydroquinone - 2% - but it combines that with natural skin lighteners like Kojic Acid, Licorice Root Extract and Mulberry Extract. To help the skin lightening ingredients penetrate more deeply and speed up results, it also includes Glycolic Acid! This combination of ingredients is potent - but can also be harsh on your skin, especially if you tend toward dry, sensitive skin to begin with. So use very little, let your skin get used to it, nurture your skin with nourishing oils and moisturizers, and most importantly: never forget to wear sunscreen when you're going out. If you've used AHAs before - whether in skin care products or in a chemical peel - and you know your skin can handle higher concentrations, Alpha Skincare's Dual Action Skin Lightener is a great choice. It combines 2% hydroquinone with a whopping 10% glycolic acid, which helps hydroquinone absorb better, reveals new, lighter skin faster and even fights hyperpigmentation on its own. It also contains a heap of nourishing ingredients like Vitamin E to keep your skin from drying out. Overall, a potent product but not recommended for very sensitive skin types. Also, it's best to stay away from this one if you have oily skin as it does contain mineral oil which can worsen the oiliness. Sure, hydroquinone products work but they can also be drying and irritating, especially when combined with AHAs and BHAs. This makes it hard to advocate a hydroquinone product as the best skin bleaching cream, especially for people who have dry, sensitive skin. Plus, during the winter months, we need all the nourishment we can get. Many opt for arguably less effective but safe home remedies for dark spots instead. 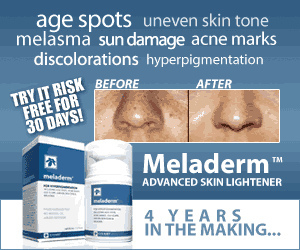 Luckily, there are some gentle hydroquinone creams out there and MD Complete's Dark Spot Corrector is the best of them. It does contain the maximum concentration of over the counter hydroquinone - 2% - as well as natural skin lighteners like Niacinamide and Alpha Arbutin, but it leaves out stronger exfoliants like AHAs and BHAs and replaces them with skin soothing goodies like Borage Oil, Allantoin, and Black Raspberry Seed Oil. The result? A brighter, more even skin tone without any dryness or flaking. Extra perk: This Dark Spot Corrector comes with a sample bottle of Vitamin C Retinol Booster that you can use alongside the hydroquinone for better, deeper absorption and faster results. We really like how it comes in a separate bottle so you can add it on if your skin can handle it or leave it out if it can't. This one's a classic. And for good reason - Ambi fade cream works and it is really, really affordable. It’s got 2% hydroquinone in it, but the formulation only contains a small concentration of AHAs (lactic acid, which has larger particles so has less penetrative power but is gentler on your skin than glycolic acid) so you may want to add a retinoid cream or exfoliating cleanser to use alongside the product. Or not. Perhaps due to the lack of stronger exfoliants, Ambi's Fade Cream is not as harsh or drying as other hydroquinone creams and is actually suitable for sensitive skin as well. And of course, the fact that it's less than $10 a bottle means you're not risking too much by trying it out. Another perk of Ambi's cream is that it contains sunscreen, although with 2% Octinoxate, it's not much. Certainly not enough to skip another, broad spectrum sunscreen if you're headed out on a sunny day. But it's a nice add-on, nonetheless. Hydroquinone is generally considered safe and effective but it matters how you use it. Knowing what to do – and what not to do – is the key to using hydroquinone safely. Check out our list of things you must know before using hydroquinone!